There are some guides on how to install python 2.7 side by side 2.6, but as of the time of writing, it is unnecessary to do so. Certbot can detect if python 2.6 is used and support it accordingly. If you did install python 2.7 as well, it may confuse the auto-detect script in certbot and cause it to attempt to install unneeded packages which will lead to conflicts. These errors indicate that certbot is confused and trying to install a version of python-tools that is incompatible. It’s not worth it, just leave python 2.6 alone and the latest certbot can sort it out. This downloads a shell script that will install all the dependencies required for certbot to run. If you open it in a text editor, you can find out what it’ll do. 2.) Make the script executable. Linux makes you explicitly indicate you want a script to be executable, so you have less chance of unintentionally executing malicious scripts online. The ./ is not a typo, include it. You’ll see a few packages being installed if they are not already present in your system. You’ll also see some “DeprecationWarning” if you’re running python 2.6. Those can be safely ignored. If you see some errors involving virtualenv (“line 558: virtualenv: command not found”), and do not get to the blue screen, execute sudo pip install virtualenv. When the process completes, you’ll see a blue screen and some basic GUI. Certbot provides this GUI that will guide you through the process, but you can also use command lines if you find that you are trying the process a few times and don’t want the hassle of re-entering into the text fields. Let’s understand the process you are about to go through before we start. To generate your certificate, certbot needs a way to ascertain you have control over the domain you are securing. For 2 to work, your port 80 needs to be free, so if you have an existing web server listening on port 80, you’re left with option 1. When the letsencrypt server is able to access this file, it proves you have access to this domain. The catch is, your webserver must be configured to be able to serve files from directories starting with “.”, because the “.well-known” directory starts with one. Linux treats files and directories with names starting with “.” as hidden files, so please make sure your server can serve them. If you are running Drupal or other CMS, they may have rewrite rules in their .htaccess that forbids access to any files or directories starting with “.”. You’ll need to lift these restrictions temporarily for the authorization to work. To test, create a folder starting with “.” and write some files in them. See if you can access them from your browser. Every server’s webroot can be different for every virtual host. Since certbot would be writing a file into this directory, make sure you have the right path. The surest way is to check the httpd config of your virtual host. We are now ready to generate the certs via command line. –email – use an email that would survive yourself if you foresee that you will be handing over this responsibility to someone else in the future. –webroot-path – the full path to your webroot. Your /etc/letsencrypt folder now contains all the keys and certificates for your domain, make a backup of it NOW – there’s no better time. If your target server is (unfortunately) using a managed hosting or VPS with cPanel, it’s comforting to know you have a web UI to install the cert. 1.) 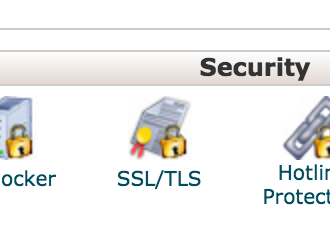 Go to the SSL Manager “SSL/TLS” under the security section. Although CPanel asks for a .crt file, go ahead and upload the fullchain.pem or cert.pem file depending on your apache version. If you only have 1 certificate, it should already be selected and you can click “Use Certificate”. The form below the button will auto populate, and now all you have to do is to paste in your private key. Copy the contents of your private.pem, and paste it in. 5.) Now click on “Install Certificate” and you’re done. After you have configured your site, remember to update any external systems that are still referencing your HTTP url and are sensitive to protocols, such as Google analytics. It is safe to run with the –dry-run command, but when you want to renew your cert for real, remove it. Have fun securing your sites! How does Let’s Encrypt work?